With so many bad public policies being proposed in Santa Fe and Albuquerque’s City Council, even the most informed voters may be confused as to what is happening or being planned. With mandatory paid sick leave that situation is amplified because the City Council is now considering a 3rd version of sick leave. To summarize, the latest proposal closely resembles the one defeated by voters in 2017. That is no surprise since Councilor Pat Davis has also been a paid activist with Progress Now NM which was involved in pushing the original sick leave ballot measure. Also, with “progressives” in full control of Albuquerque City Council and the Mayor’s office they see little opposition to their plans. It has been my observation over the years that job killing legislation, such as this, is usually introduced by legislators who have never successfully run a for profit business. But of the three counselors who have introduced a proposed ordinance (Sanchez, Harris and Davis), Sanchez and Harris have extensive private sector work experience. 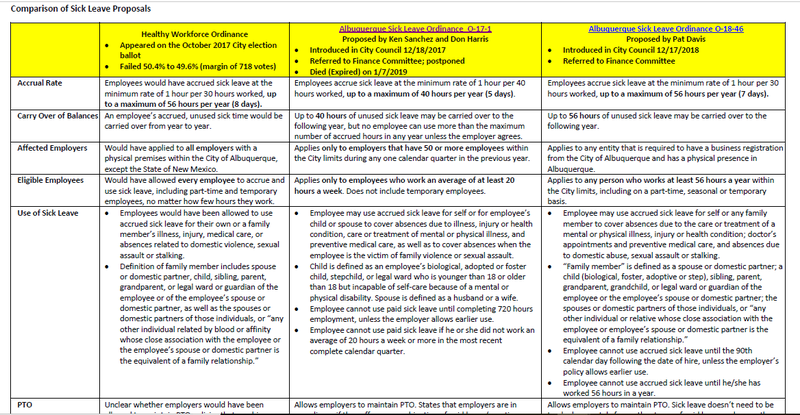 I am certain both know what a job killer this ordinance would be,the enormous compliance costs and how it would make Albuquerque an even less attractive place to do business. Perhaps these counselors are so much smarter than the rest of us that they see things we don’t. I don’t see how driving more private business out of Albuquerque will make it a better place, but what do I know?